Happy 4th of July!! I hope everyone has a safe and fun-filled holiday. For this Friday I thought I would make two cards with totally different styles….one for the holiday and one for my daughter who thinks I put stamping before her (“you never take me to the mall because all you care about is stamping!”). I guess she knows just what to say to kick in the guilt factor. You don’t have to use cupcake images to participate in Taylor’s cupcake challenge…but if you have them, why not use them. 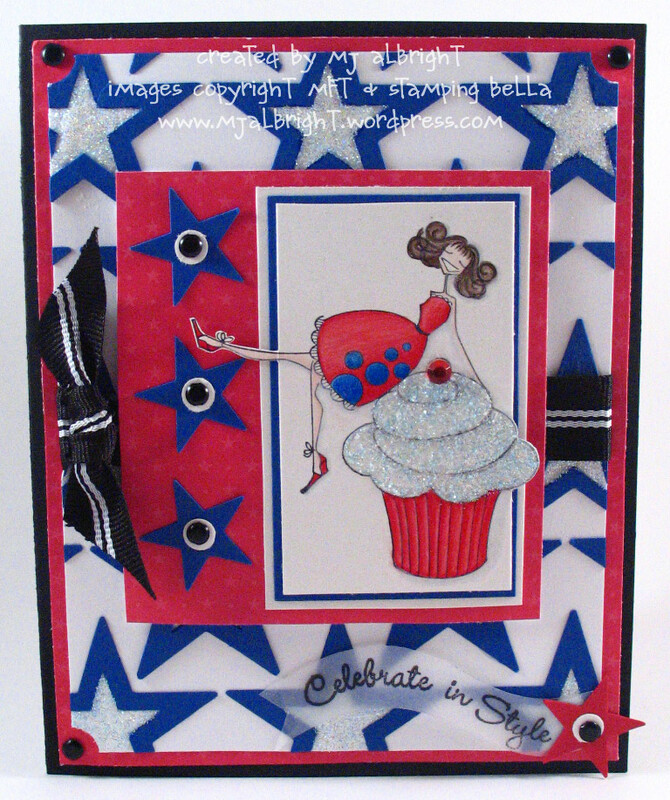 I never thought I’d be making a 4th of July card with this Stamping Bella image Cuppacakeabella. Once I found a good sentiment from MFT’s Let’s go for a walk and some patriotic colors, I think it turned out very nice. I created the background paper using Whisper White CS, SU Star and Large Star Punches, Crystal Effects, and Dazzling Diamonds glitter. The image was colored in with Prisma Pencils. The sentiment was stamped on vellum. The ribbon is SU! Jersey Ribbon Originals. The cupcake icing was created with a layer of Baby Blue Stickles, covered with Crystal Effects, and finished with a fine dusting of Dazzling Diamonds glitter. Here is the second card that I made for my daughter. For this one I used BasicGrey Two Scoops PP Paper Pad and SU! stamp set Seriously Sassy. 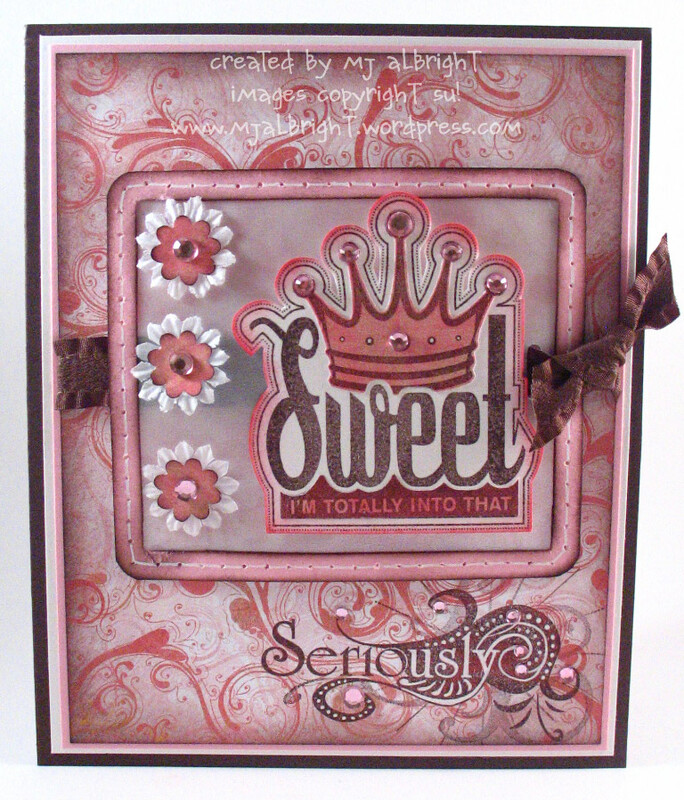 The main center rectangle is a sheet of metallic vellum with a border created with Pretty in Pink CS and Faux-stitching. Flowers are from the Pretties Kit with flower punches from Boho Blossoms Punch. Added pink adhesive rhinestones throughout card. Ribbon is May Arts. This weeks featured cupcake sampler is Michelle from Just Painting Around. Make sure to check out her creation for today as well. SERIOUSLY sweet cards Mary jo! LOVE the fun design for Taylor’s Cupcake Sketch, your design is wonderful. The other card is FABULOUS as well. Hope you have a fun & safe 4th of July. Wow, you’ve out done yourself…TWO cards! Both are spectacular. I love all the detail of your Bella card…such great elements. Happy 4th! Awesome card! Love the image, the way you cut it out, the glitter… TFS! these are both great!! Happy 4th to you too!! Awesome MJ! I so need both of these sets! 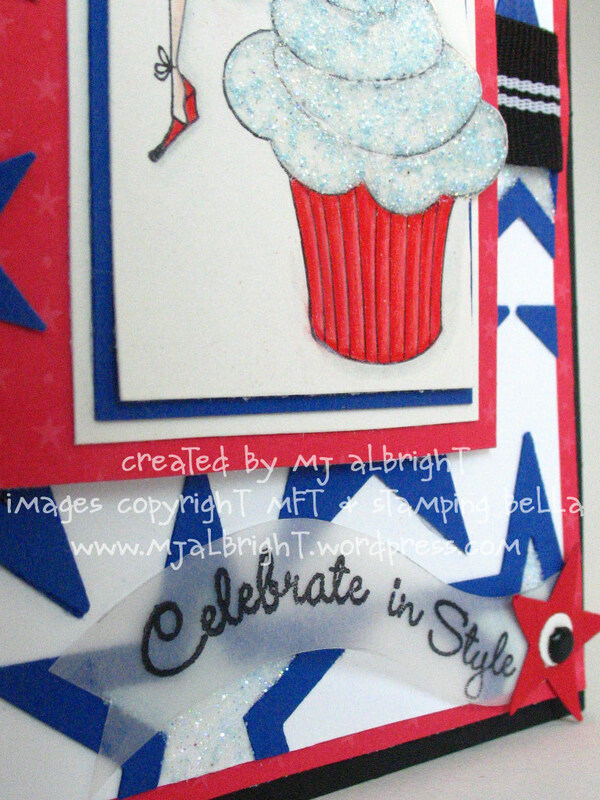 MJ – love your 4th of July card – that punch BG is soo soo soo clever and cute! And the second card – well that just rocks! Fabulous cards … love the metallic vellum. That is one patriotic bella! So sweet! I just love your cards today and had to pop on over to tell you so. Using the Bella cupcake stamp for the 4th of july holiday is shear genius! So unique! And I love the pink/teen card too. Any teenage girl would love it. Love the dp you used with the image. Love the ribbon, flowers, stitching, etc. Great job. Both of your cards are absolutely amazing girl! 😀 Your daughter sounds like my husband too! Hehe. They definitely know the right things to say huh? Great job on that! Very festive! Both cards are adorable, & I’m wishing I had got that cupcake bella stamp now. You do beautiful work. Have a great weekend! Absolutely Beautiful cards…. i love your work.